Ken Bayles is the Associate Vice Chancellor for Basic Science Research, as well as Vice Chair and Professor in the Department of Pathology and Microbiology. He is also the founding director of the Center for Staphylococcal Research (CSR), the first of its kind in the country to focus on this important pathogen and its impact on human health. Dr. Bayles earned his bachelor’s and PhD degrees from Kansas State University, where he received training in bacterial genetics and toxin production by Staphylococcus aureus. He then worked as a post-doctoral associate at the University of Maryland, examining the regulatory response in Bacillus subtilis and S. aureus to DNA damage. In 1996, he joined the faculty at the University of Idaho where he spent nine years developing the foundation for understanding the molecular control of bacterial cell death. In 2005, he came to UNMC with the goal of building an internationally recognized program focused on S. aureus research. 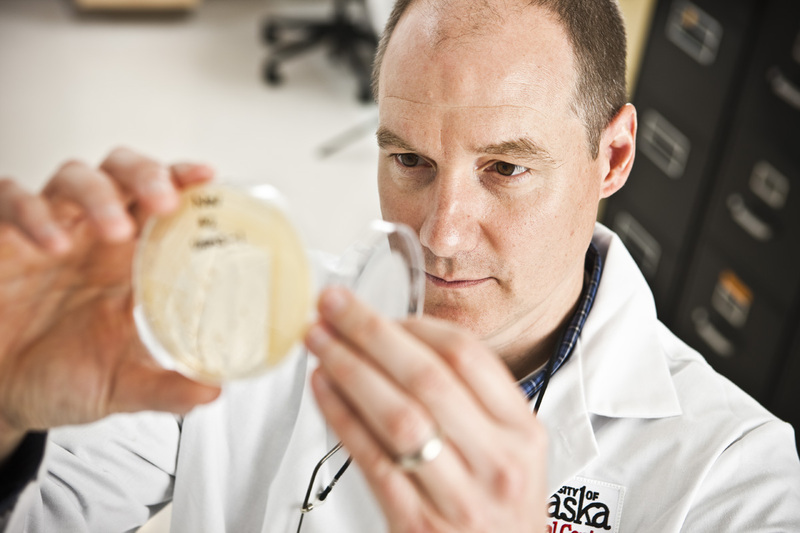 With a large program project grant from the National Institutes of Health, Dr. Bayles has combined the talents of several investigators at UNMC, the University of Iowa, and the University of Florida to gain a better understanding of the role of Staphylococcal biofilm in the development of disease. In 2009, he was named a Distinguished Scientist at the University of Nebraska Medical Center. Dr. Bayles has also been involved in a variety of national and international activities including serving as a regular member of the Bacterial Pathogenesis study section for the National Institutes of Health and as the chair of the Gordon Conference on Staphylococcal Diseases, the leading research conference in this field.